I loved reading fairy tales when I was a kid and now as a mum, I like reading them to my children. 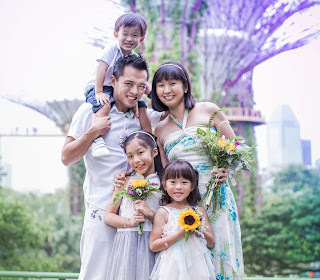 There is just something whimsical and enchanting about these stories and although I do not want my kids to think that there is no suffering in the world, I also like them to believe that happily ever afters do exist. We have this book of fairy tales that we like to use quite often for bedtime stories and I guess it's not a surprise that my girls are in love with tales like Cinderella, Goldilocks and the Three Bears, and Hansel and Gretel. There is also this fairy tale that Angel is fond of since she was a toddler and now that she knows how to read all the words, she likes to read it to the younger sister too. Can you guess what it is? Hint: Three goats and a troll. Yes, it's The Three Billy Goats Gruff, which is a Norwegian fairy tale collected by Peter Christen Asbjørnsen and Jørgen Moe, first published between 1841 and 1844. The troll that it talks about is a supernatural being in Scandinavian folklore, often depicted as an ugly, slow-witted creature that dwells in isolated rocks, mountains or caves. You probably know that we stayed in Scandinavia for a good four years so for Angel, she has come across trolls, fake ones of course, from when she was still a baby. That is perhaps the reason why she is more captivated than terrified of these creatures now that she is older. 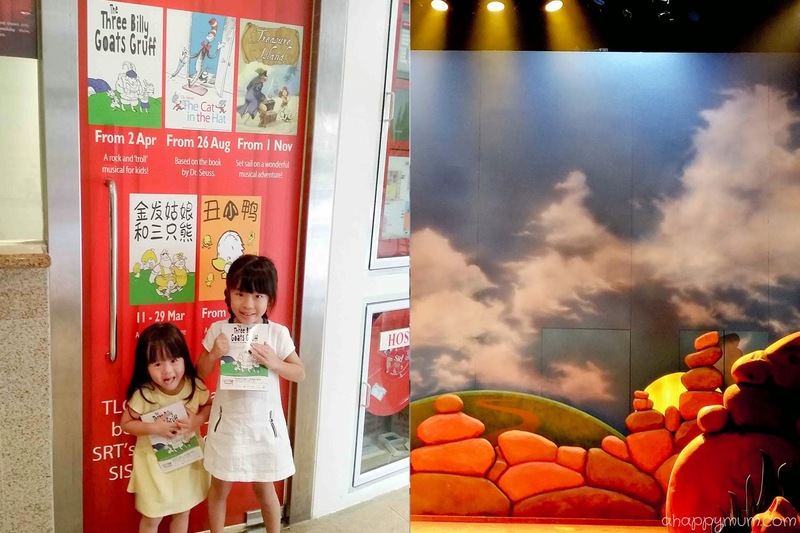 So, when we were invited to watch The Three Billy Goats Gruff, which has been adapted into a musical for kids aged 2 to 6 years old, you bet we were thrilled to know that one of our favourite fairy tales was going to come alive on stage! 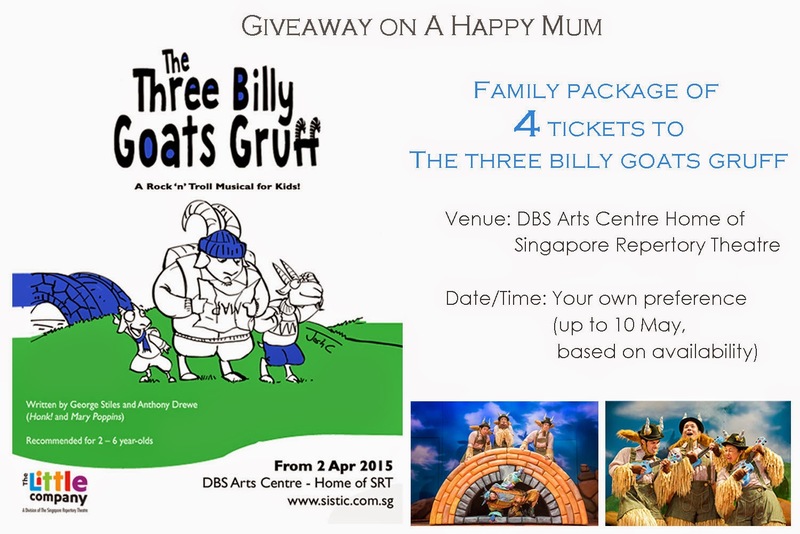 Presented by Singapore Repertory Theatre's The Little Company - a theatre company producing quality plays for children using professional adult actors, The Three Billy Goats Gruff is a musical designed to thrill, entertain and educate young children while bringing fun and laughter to the entire family. 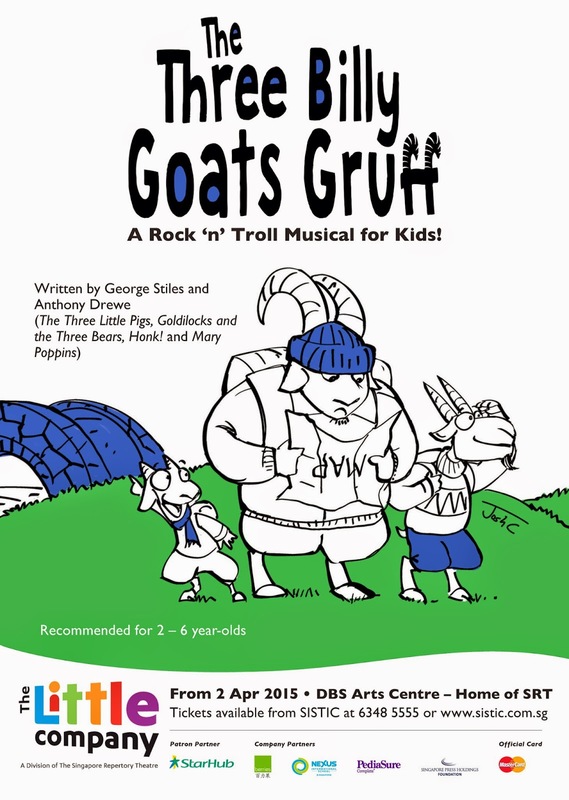 In the story, the Three Billy Goats Gruff (affectionately known as "Baby", "Middle" and "Big") graze happily together with their caretaker, Little Bo-Frilly. One day, it dawns on them that they are in the middle of a dreadful drought. To their dismay, slowly but surely, they are running out of food. Together, the gang makes the decision to cross a bridge to the other side of the valley, where lush green grass seemingly awaits. Unfortunately, below the bridge lives a frightening troll that loves to feast on..... goats! Can the goats outsmart the monstrous, greedy troll in this fight for survival? We totally enjoyed the songs, written by the award-winning West-End musical theatre songwriting duo George Stiles and Anthony Drewe, and couldn't help but sing along to them during the show. The cute choreography, tap dancing and make-believe ukulele strumming also got us grooving to the beat and I really applaud the efforts, professionalism and zeal displayed by the cast. The kids also loved the character Little Bo-Frilly, who is a sweet, innocent girl dressed in frills who always forgets about her goats (yes, she is supposedly related to Little Bo Peep). I like the camaraderie she has with the goats and how their strong friendship helps them to overcome the hurdles. As for the grumpy old troll, he's certainly one intriguing character though the fierce-looking costume, husky voice and red lights that shine whenever he crawls out of the bridge might intimidate some of the younger audience in the front rows. Well, every story needs an antagonist, right? I definitely think that the troll is the character who made the whole story more interesting and exciting for the kids! So, what happens to the troll eventually? Do the goats find what they were looking for? And, is the grass always greener on the other side? I love that there is a moral to the story so I can take the chance to teach the kids a lesson on life. As for the ending, I'll leave that for you to find out. This show is recommended for 2 years old and above. Infant in arms or children aged 2 years can enter provided they have tickets. To book the tickets, go here or call the Sistic ticketing hotline at 6348 5555. Good news! 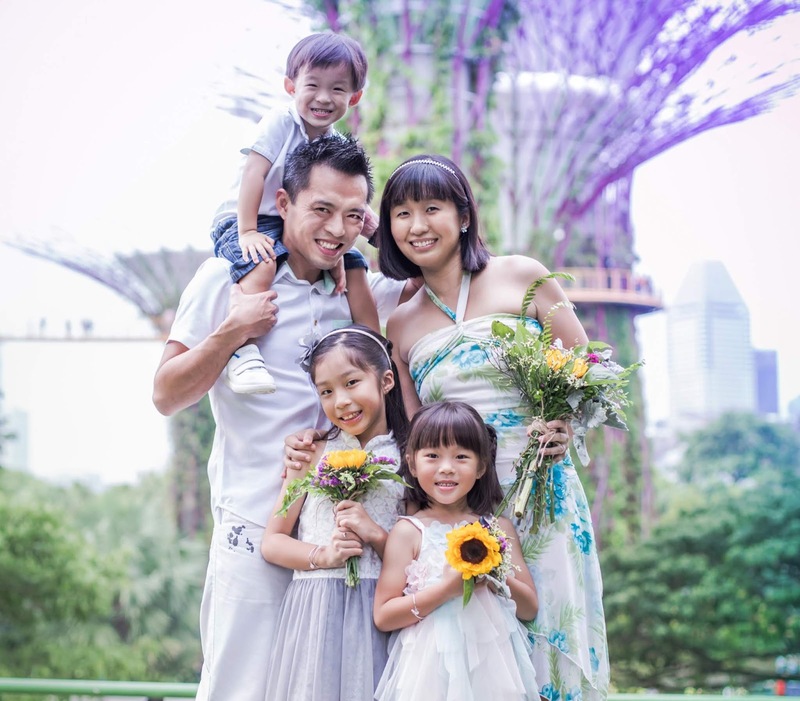 For those who wish to watch the show, I have a family package of 4 tickets to give away! This giveaway is open to readers worldwide, as long as you can make it for the show! The winner will be able to select his/her preferred date and time (up to 10 May 2015) based on ticket availability. To participate, simply leave a comment in this blog post with your name, email address and tell me which is your favourite fairy tale! Indicate in the Rafflecopter widget that you have done so and to increase your chances of winning, you can choose to carry out the rest of the options. Good luck! Disclosure: We were invited to watch The Three Billy Goats Gruff for the purpose of writing this review. Production images are provided by SRT. All opinions are our own. My favorite is The three little pigs! My favourite fairy tale is Snow White & the Seven Dwarfs. My favourite fairy tale is The Ugly Duckling. Hope to win. I'm sure my princesses will love it. My favorite fairy tale is Little red riding hood… Both my princesses favourite fairy tale is Cinderella. Fav fairy tale: Pinnochio cos it teaches my boy always to be honest. My favourite fairy tale is Three Little Pigs as the story tells us that one should not be lazy and siblings need to be help each others. My favourite fairy tale is Three Little Pigs. Three little pigs, Goldilocks and the 3 Bears! Snow White and the 7 dwarfs is my favourite fairy tale. our fav: three little pigs. My favourite fairy tale is Cinderella! Little Red Riding Hood is my favourite! My all time favourite is 3Little Pigs. My favorite is The little red riding hood! My favourite fairy tale is The Three Little Pigs!. We love three little pigs and often act it out too. The three little Pigs who worked hand in hand together like the three billy gruffs goats! my favourite fairytale is snow white! Hoping to bring my kiddo to his first musical!